Henrietta Liston continued to describe the visit she and her husband made to Niagara Falls in 1799. I have said that the noise & the spray are the first objects which strike the Spectators, & prepare their Senses for the magnificent scenes afterwards presented to thier [sic] view. Great part of that noise proceeds from what are called the rapids, which extends for two miles above the Falls. The River of Niagara, one of the most beautiful we had seen, is more than three times broad at Fort Erie, & as it gradually contracts, the rapidity of its course redoubles from the greater declivity of the ground over which it rolls, a chain of white rocks raise themselves on each side of the bed of the River, & forms at last a Table of Rocks . . . almost a half circle, over which the immense Mass of water falls into the Gulf beneath. As early in the Evening as we could tear ourselves away from an object, for which we had travelled so far & suffered so much, We reseated ourselves in our Cart, which had been left half a mile distant on the high road, & we reached the Fort of Chippaway, two miles up the River, where we found a very good Inn. . . .
We reached the Inn wet & dirty, & fatigued, but a good fire & tolerable Supper recruited & enabled us, after a comfortable sleep, to set out next morning immediately after breakfast. . . . The men determined to go down to the Bed of the River below the Cataract but for this purpose a Guide became necessary; with a view to find one we wandered to a Farm House sweetly situated about a half a mile from the Falls, & commanding a perfect view of Slucher Falls. Here we found a respectable Farmer & some handsome Daughters, the youngest, almost ten years old, readily agreed to conduct us to the Bed of the River. She led us through Corn-fields, meadow ground, & thick woods to the brink of a precipice, a little alarming to look at, but I had taken my resolution, & with the assistance of Mr. L. & the young Gentlemen I was enabled to get down this Steep, holding by the Rocks & Branches, in constant apprehension of both giving way; at one spot we found a small Ladder, of ten or twelve steps firmly fixed. It was erected for the Wife of Gen. [John] Simcoe, when he was Governor of Upper Canada, & I beleive I was the second Gentle woman who descended it. An Indian ladder appeared to have been thrown down to make way for this, (the Indian Ladder consists of the Body of a small Tree in which are notches cut at equal distances, sufficient to place the heel & toe); one very critical step having alarmed me considerably, I was seized with a trembling in my legs which obliged me, on reaching the Bottom, to sit down on the Stones near an hour & my little Conductress, who ran up & down the Hill like a Kid,—gathered & brought me Sorril & wild Rasberries—called in England Virginian—which refreshed me a good deal. We saw several Boys standing, on the Rocks & fishing with very long lines, regardless of the sublime objects around them. Being now on a level with the River, We looked up to these immense Cataracts, instead of looking down upon them as on the preceding Evening, From the Curve which the Horse Shoe Fall makes, it is from below that the complete Coup d’oeuil [sic] is taken. Near the Slucher Fall, coming out of the corner of the little Island, is a small Fall, at least what would merit that term in any other situation, but placed so near to objects of such magnitude it appeared a beautiful white Feather, & is called the Horses tail. While I rested, the Gentlemen of the Party walked with much difficulty over the Stones along the side of the River, near half a mile, & got behind the Wall of Water formed by the curve of the Horse Shoe Fall. They could advance but a very little way from want of air. They were however enabled to gather from the Rock a thin transparent Spar formed by the Water, though in doing this the number of water Snakes incommoded them a little; these are, though disgusting to look at, the most innocent of their Tribe. I cannot say that the superior beauty of the scene sufficiently repaid the trouble of descending to the Bed of the River, as the Table Rock certainly affords a very enchanting view. From our present situation, however, we discovered the very strange appearance of this Table Rock, which struck us as a thin peice [sic] of stone projecting between 40 & 50 feet from the large Mass over which the Cataracts fell, & hanging over this tremendous Gulf in danger every moment of falling into it, & I was a little agitated on recollecting that the Evening before, we had lain down on our breasts upon this Bed of danger in order to look at the Horse Shoe Fall with safety. . . .
Finding myself sufficiently recovered, & our curiosity gratified I attempted the ascent, which I performed with much more ease than I had gone down. We drank milk with the Father & Sisters of our little Girl, took a long & last view of the Slucher Fall, & rewarded our Guide not only for the dexterity with which she had performed her task, but for the good humoured vivacity with which she had amused us. Louise North, The Travel Journals of Henrietta Marchant Liston (Lexington Books: Lanham, Maryland, 2014), pages 87-91. In 2014 Louise North, a co-editor of In the Words of Women, published a delightful little book called The Travel Journals of Henrietta Marchant Liston from which this blog has excerpted several passages. Having featured Ann Powell’s description of Niagara Falls in the previous post I thought it would be interesting to read what Mrs. Liston thought of that marvel of nature. 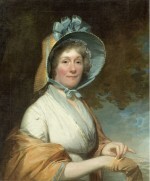 Mrs. Liston had accompanied her husband Robert to the United States in 1796 when he was named British minister to the new nation. During her stay she kept a journal and wrote letters to her uncle in England describing the country and the people they met. In August 1799, the Listons visited Niagara Falls. We were now within eight or nine miles of this fanfarred Wonder without hearing any noise from the Waters, though it is said, that when the Wind is in certain quarters the roaring of the Falls is heard at the distance of twenty or thirty miles; no sound reached us till within three miles. The first part of this truly sublime & interesting object visible to us, was a thick vapour which rose beautifully up & seemed to mix with the Clouds. We quitted our Cart, & seeking our way—for we found no one to guide us—through the Woods & Fields, were led by the noise & the Spray to the first opening amongst the trees. The Sun was just near setting, & no Spectacle in the World could have so impressed us. Never, indeed, can I forget the sensations of astonishment & of delight, which I experienced at the first glance of this stupendous object, for it was a glance only, dimly perceived through the mist which envelloped it. The beauty of the rain bow, formed by the departing rays of the Sun, & extending from one fall to the other, blending its vivid colours with the sparkling of the water cannot be described. We stood enchanted, & could scarcely recover ourselves sufficiently to descend a steep Bank & travelling by an Indian Path, (that is a track for one at a time), through the Bushes, reached the Table Rock, a projecting point so called, from whence you have the first complete view of the Cataracts, & which is a part of that chain of rocks over which the Water precipitates itself. 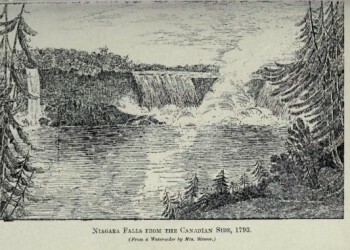 The Cataract of Niagara is divided into two Falls by a beautiful little wooded island, the centre of which forms a line of division betwixt the British & the American Possessions. The whole breadth of the falls, including the Island, measures nearly a mile, the Island not occupying quite a fourth of this. The height does not exceed a hundred & forty or one hundred & fifty feet. These Cataracts assume very different characters, a part of that on the British side, forms a curve & is called the Horse Shoe; the Water appears like a Wall, & projects with so great a force as to be perfectly distinct from the rock over which it falls, & allows of your penetrating betwixt them, when you descend to the Bed of the River. a Gentleman well accustomed to the measurement of water, conceived from the experiments he made, that this Wall of Water was not less than twenty feet thick, & from its thickness it assumes a deep tinge of green. The Cataract on the American side, called Slusher, presents a foaming brilliant white Sheet. Both the falls receive a thousand different modifications & beautiful tints from the manner in which the Sun happens to strike upon them, from the State of the atmosphere, or the force of the Winds. The great sublimity of this Scene proceeds, chiefly, from the immense Body of Water which precipitates over the rock. It is in fact the Mass of Water flowing from all the upper Lakes, or interior Seas of Canada. The Lake of the Woods, & Lake Superior, Lake Huron, Lake Michigan, & Lake Erie, the North East end of which last, connects itself with Lake Ontario, by means of the river of Niagara, which is about thirty miles in length from Fort Erie to the Fort of Niagara, & forms a part of the boundary betwixt the United States of America & upper Canada. Read on in the next post. Niagara Falls was known to Indians, explorers, missionaries, and fur traders in the seventeenth century. In the eighteenth century it became a waystop for settlers and government officials as Upper Canada was developed, as well as a familiar landmark to loyalist refugees who migrated to the area from the warring colonies. Several visitors, including women, recorded their observations and impressions of the “Cataract” in diaries or journals. Reading what these various observers wrote gives a sense of the wonder and awe with which this extraordinary phenomenon of nature was viewed and goes far in explaining why the Falls became a popular tourist destination in the nineteenth century. Ann Powell (1769-1792) was a Bostonian by birth. Of distinguished lineage, her well-to-do family left Boston at the start of the American Revolution. When her older brother, William Dummer Powell, was appointed superior court judge in Detroit—one of the forts still in British possession in 1789—Ann made the journey from Montreal to Detroit with him and his family. She kept a journal recounting her experience, to which she added and amended from memory. We left Montreal on the 11th of May, 1789. . . . [and] went to our boats; one was fitted up with an awning to protect us from the weather, and held the family and bedding. It was well filled, eighteen persons in all, so you may suppose we had not much room; as it happened that was of no consequence, it was cold on the water, and we were glad to sit close. This mode of traveling is very tedious; we are obliged to keep along shore and go on very slowly. . . . This part of the country has been settled since the Peace, and it was granted to the troops raised in America during the war. We went from a Colonel to a Captain, and from a Captain to a Major. They have most of them built good houses, and with the assistance of their half pay, live very comfortably. [At the landing, eight miles from Fort Erie] the Niagara river becomes impassable, and all the luggage was drawn up a steep hill in a cradle, a machine I never saw before. . . .
After dinner we went on . . . to Fort Schlosher. . . . All our party collected half a mile above the Falls, and walked down to them. I was in raptures all the way. The Falls I had heard of forever, but no one had mentioned the Rapids! For half a mile the river comes foaming down immense rocks, some of them forming cascades 30 or 40 feet high! The banks are covered with woods, as are a number of Islands. . . . One in the centre of the river, runs out into a point, and seems to divide the Falls, which would otherwise be quite across the river, into the form of a crescent. I believe no mind can form an idea of the immensity of the body of water, or the rapidity with which it hurries down. The height is 180 feet, and long before it reaches the bottom, it loses all appearance of a liquid. The spray rises like light summer clouds. . . . I was never before sensible of the power of scenery, nor did I suppose the eye could carry to the mind such strange emotions of pleasure, wonder and solemnity. For a time every other impression was erased from my memory! Had I been left to myself, I am convinced I should not have thought of moving whilst there was light to distinguish objects. With reluctance I at length attended to the proposal of going, determining in my own mind, that when I returned, I would be mistress of my own time, and stay a day or two at least. . . . Sadly, Ann Powell had a short life. She married Isaac Winslow Clark, a fellow loyalist who had also fled Boston—his family firm had owned the tea that was thrown into Boston Harbor in 1773—and moved to Montreal where she died in childbirth in 1792. Ann Powell, Journal of Miss Powell of a Tour from Montreal to Detroit, ed. Eliza Susan Quincy (New York, NY: A.S Barnes & Company, 1880), pages 39, 42, 43. See also In the Words of Women, pages 255-56.